LAST FEW POSTCARDS REMAINING (July 2016). 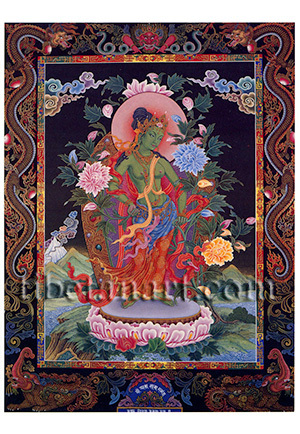 This lovely depiction of Standing Green Tara, the female bodhisattva of compassion, was painted by Dinesh Charan Shrestha and based on an original composition drawn by his brother Uday. Green Tara stands gracefully in 'triple-bend' (tribhanga) posture upon a silver moon disc and a pink lotus. She is youthful and beautiful, with a sweetly smiling face, firm breasts, and she wears all manner of divine silk garments and jewel ornaments. With her hands she holds the stems of a pink and blue lotus, and her twisted hair locks are coiled up into a large topknot, with some of its loosened strands hanging freely about her shoulders. Her halo and jewelled aura are surrounded by a profusion of lotus blossoms, and she abides within a beautiful landscape of mountains, clouds, trees and lakes. The inner border of her torana is decorated in colourful brocade designs, while her dark outer torana is embellished on its top and sides with the traditional Newar elements of the crowning serpent-devouring head of kirtimukha, and a pair of jewel-grasping dragons. In the lower corners are two ferocious makaras or crocodiles, and the emblem at the bottom centre is inscribed with the deity invocation, Shri Arya Tara Nama, and the artist's name below.